Material Story Lab, (which is in the process of being physically established on Nordkraft), is perceived as the natural power center of the initiative. Material Story Lab’s practices draw on the onto-epistemology of material storytelling that comprises sets of practices of the intra-action of stories of material artifacts, stories of space, stories of bodies as well as oral storytelling (e.g. Strand, 2011). 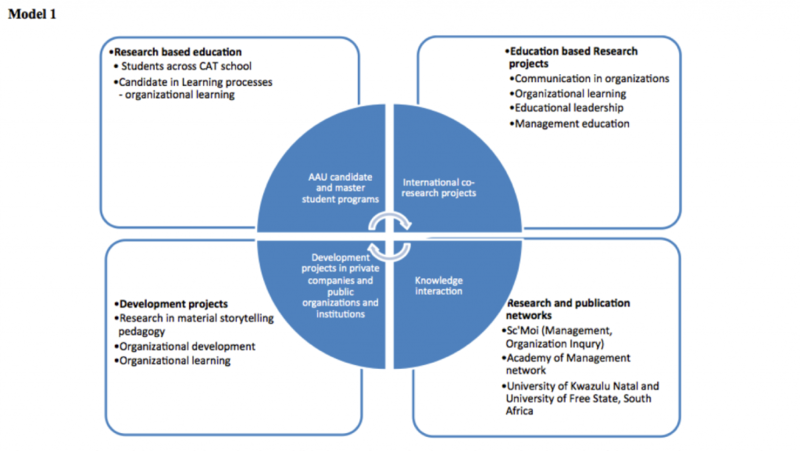 By enhancing the use of supplementary pedagogical means in fusing various experiential learning modalities with propositional and practical kinds of knowing, the onto-epistemology of material storytelling is intended to experiment with integrating alternate forms of knowing in the PBL-model at AAU and beyond. The purpose of Material Story Lab is thus to integrate these new innovative teaching practices and new organizational intervention methods with international research projects and knowledge networks. We draw on research networks and projects that already exist and in which we already take an active part. In model 1 we visualize the different activities composed in the network of Material Story Lab. The 4 parts are in close intraplay and adds to eachother.